Kanabo Research is proud to present the promising results of its pre-clinical trial, which brings the company one step closer to providing a safe remedy for insomnia and other sleep disorders, without the risk of dependency or the possibility of an overdose. 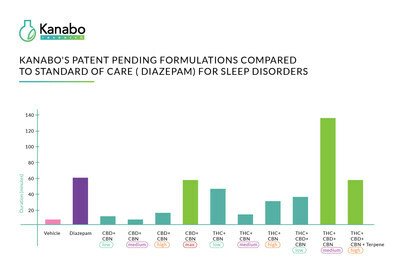 This in vivo study, evaluated the efficacy of varying compositions of active ingredients in cannabis to induce sleep, in comparison to Diazepam, the active ingredient in Valium. Several formulations performed extremely well, reaching close to 100% of the efficacy of Diazepam, with one formulation in particular increasing sleep duration by 150%. Kanabo Research was able to prove synergy, with greater efficacy when all three cannabinoids and terpenes were present than when used singularly. When combined, even a small amount of each contributed to the efficacy of the formulation. As a secondary finding, the study established the value of THC as an integral part of Kanabo Research's formulations. Even in small doses, THC generates a synergistic effect with other cannabinoids and terpenes. This emphasizes and reiterates the value of the whole plant profile, especially when compared to isolates of cannabinoids. These are promising results for patients in light of the well documented much less severe side effects associated with low THC compositions in comparison to Diazepam. These early findings are promising and will be applied to the next stage of research - clinical trials for human use. Kanabo Research is currently in the process of establishing the framework for such a study, and aims to perform the trials and report on successful results by the end of the year. The significance of such reliable, reputable scientific research, as a means of establishing cannabis' status as a legitimate medicine cannot be underestimated. Cannabis has evolved into a lucrative revenue stream for investors and a powerful new weapon in the war against multiple chronic disorders. Up to now, those suffering from sleep disorders have had to rely on habit forming conventional medications such as Valium and Ambien that require the user to gradually increase the dose over time, often resulting in dependency. These medications can have adverse effects, including the risk of a lethal overdose. A safer alternative would be a game-changer for sleep disorder sufferers. Avihu Tamir, Kanabo Research's Founder and CEO noted, "While we are only in the preliminary stages of our research, the results of our pre-clinical trials are extremely encouraging for millions of sleep disorder sufferers around the globe." An estimated 70 million Americans have insomnia, and a further 43 million suffer from obstructive sleep apnea (OSA). According to P&S Market Research, the sleeping aids market is set to be worth of $101.9 billion by 2023. Tamir continues: "We are in the process of developing two product lines, one requiring a medical cannabis prescription, and the other, an over the counter product that does not contain THC. We have only scratched the surface of the full medicinal potential of cannabis and as Kanabo Research mines this valuable resource, we hope to provide safe alternatives to conventional medications for those suffering from a wide variety of conditions. "